Rachel, the eldest of the Price daughters, is portrayed as a rather narrow-minded, superficial young woman, who dislikes the Congolese more blatantly than anyone in her family except for Nathan Price himself. Unlike her siblings, Rachel makes few, if any, attempts to get to know her neighbors in the village of Kilanga, although her fair skin and good looks lead many in the village to stare at her. After the CIA-sponsored military coup in the Congo in the mid-60s, Rachel marries Eeben Axelroot in order to guarantee her own safety. Over the next 15 years, she marries a string of wealthy, powerful men, who provide for her but give her no spiritual satisfaction. Ultimately, Rachel comes to own a profitable hotel, which again provides her with money but leaves her feeling lonely and unfulfilled. Rachel is arguably the member of the Price family who grows the least over the course of the book: by the end of the novel, she’s still self-absorbed and superficial. The only lesson she’s learned in her life, she claims, is that the purpose of life is to look out for oneself. 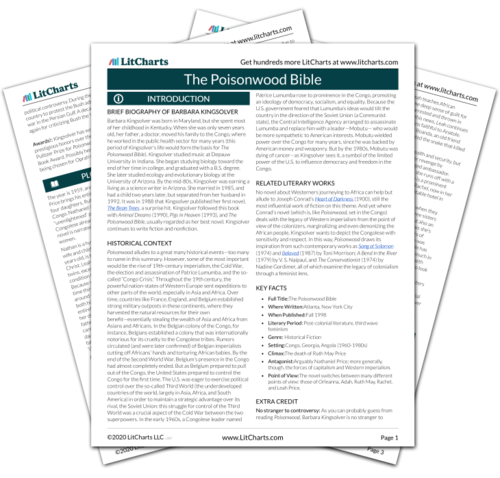 The timeline below shows where the character Rachel Price appears in The Poisonwood Bible. The colored dots and icons indicate which themes are associated with that appearance. Arn, Jackson. "The Poisonwood Bible Characters: Rachel Price." LitCharts. LitCharts LLC, 29 Jun 2016. Web. 19 Apr 2019. Arn, Jackson. "The Poisonwood Bible Characters: Rachel Price." LitCharts LLC, June 29, 2016. Retrieved April 19, 2019. https://www.litcharts.com/lit/the-poisonwood-bible/characters/rachel-price.